Chocolate was first consumed as a drink, not as a bar or a truffle. 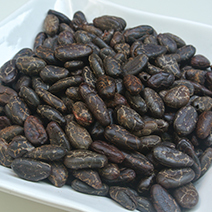 The Mayan’s of Mesoamerica discovered that by grinding and mixing the Cacao beans with water it could produce a bitter medicinal drink. The ritual beverage, produced from the beans were reserved for the nobility, priests and high officials as it was believed to have restorative and aphrodisiac powers. Chocolate Shaman is bringing back this original way of consuming chocolate. Using the finest cacao we could source on the planet, our cacao beans are wild harvested from local indigenous people in South American. 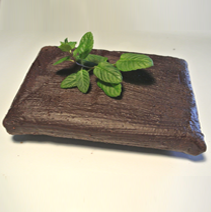 They are sun dried and special care is taken to ensure the nutrients remain in the cacao and it is not over processed. People describe Chocolate Shaman’s cacao ceremonies as a heart-opening energy because it significantly increases blood flow and generates an expansive feeling, often centered around the heart. Intimacy is easier, whether romantically or simply with feeling a deeper connection with friends. Focus is easier and more effortless. Often you will feel a gently glowing or vibrating energy. 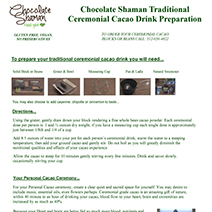 For more information on Cacao Ceremonies please view the video below and download the PDF to learn how to prepare your own ceremonial drink. Delicious as a snack by itself, add to your favorite trail mix or sprinkle a few beans on top of your smoothie!